I realized the other day while gathering and tabulating receipts for the year, that my expenses for cheese far outweighed my expenses for chocolate. 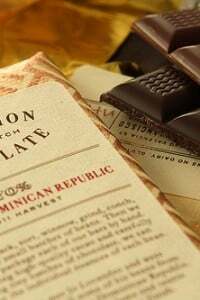 I’ve always been fascinated, and wanted to highlight on the site, some of the great bean-to-bar chocolates being made in America since I know it can be a tough business making chocolate on a small scale. But one that fell under my radar was Rogue, which was started after I’d moved away from the states so I wasn’t able to give it a try. Also because I thought what all these American bean-to-bar chocolate makers were doing was tremendously exciting. And two of my friends had started a company and I saw how much work and passion (and money) went into what they did. They grew and flourished, but some of the smaller companies weren’t getting the recognition that I thought they deserved, so I decided to profile them. And since it’s my site, I can do whatever I want. So there. When I was in Texas recently, a woman who went by the name Madame Chocolate came to one of my classes. Afterward, she passed me a few bars of artisanal American chocolate to act as emergency rations during my trip, then slipped back into the night. I wanted to dive right in, but was thwarted by an overload of Texas bbq and fried chicken, so I thought it prudent to carefully bring it home and try it there. The bar didn’t fare that well in my carry-on, but at least it arrived in large, recognizable shards. 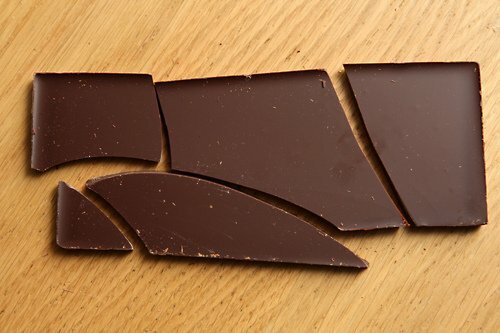 The first thing you notice if you open up a bar of Rogue chocolate is that the bars are void of ornamentation, and aren’t scored or sectioned into bite-sized pieces. Which is fine, because I don’t want anyone telling me how to serve my chocolate. (Except maybe the TSA.) But it also allows the suave beauty of the dark chocolate to shine through. This bar is called a Piura bar, named after a province in Northern Peru. This bar is pricier than their other bars, but chocolate-maker Colin Gasko only made a few thousand bars from the four bags of cocoa beans (which he calls a “nano lot”) that he was able to procure from an organic cacao farm in South America. The bar has a brisk, fruity flavor with almost no bitterness or harshness in the aftertaste. There’s a touch of maltiness to the ending, and the mildness of the bar allows some of the gentler flavors of the beans to shine through. The packaging says it has a bit of “raspberry” and I did find some fruitiness, although not too much. Which is good, because I’m more of a fan of dark and complex chocolate. But everyone’s palate is different, which is why there’s no “best” or reason for lists of “top ten” chocolates to be followed like the bible. Colin oversees the letterpress labels for the chocolate bars he makes in his tiny facility in Minneapolis and just produces three or four different kinds of bars, depending on the availability of cocoa beans. 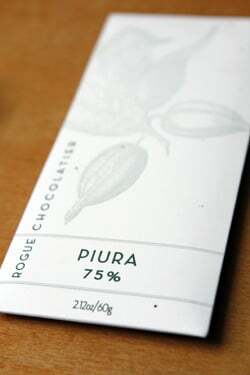 (Plus when you print your own labels, it’s easier to change names when you get a nifty new chocolate.) Next time I head to the states, I’m looking forward to trying the others. But I’m keeping them out of the scanners at the airport, which seem to be dangerous places. At least for chocolate bars. *Interestingly, I would classify Colin as a chocolate maker more than just a chocolatier, but he chose to call his company Rogue Chocolatier. Can you image a sea of changes in consumer pattern, away from Nestle and Hershey’s? A change large enough to support artisan chocolate makers in each State (and Province for us Canucks)? The result being that when on a road trip, each few hundred miles you can enjoy a new flavor, a new distinct make of excellence in sweetness? Celiac Husband: Well, the ‘big boys’ are also getting into the game–just like what happened with ‘organics’ a few years ago, when companies that normally wouldn’t have dreamed of coming out with organic products are stamping it on the labels of whatever they can. Hopefully in the chocolate world, everyone can co-exist as I think there’s a market for lots of different kinds of chocolate for all budgets and tastes. Michael: A few years ago I tasted beer brewed with cocoa beans and it was surprisingly good! The word “Rogue” has taken on a variety of meanings in the past few years, but there’s companies really do mean it.. Thanks for sharing! I was wondering if you know of any good dark chocolate bars with sea salt. It’s my favorite combination. A true work of art, for all the senses! Thank you for giving small artisans more exposure. I clicked on the Rogue link. Now I am not only lusting for their chocolates, but also their Heidelberg Letterpress (the pictures enlarge to reveal lots of detail). Many years ago I did restructuring advisory for a chocolate manufacturer is Samoa. Cocoa beans from Samoa and Fiji are of very high quality and even years ago the factory had good prospects (restructuring was due to management issues, not quality/market related). The factory has good prospects in spite of the location (Samoa is in the middle of nowhere). Rising prices, increased focus on fair trade, ecological etc is great for widening the field. Three-Cookies: People often apologize to me (for some reason) for liking things like M&M’s and so forth. I don’t know why—I like them too! I don’t think of them as ‘chocolate’, but more as candy. Ditto with Hershey bars and other confections. I don’t really think of them in the same breath with bean-to-bar chocolates, but they have their place and I am guilty of eating M&M’s (and York Peppermint Patties) on occasion. . .
Merisi: Yes, the printing is beautiful. The insert in that came with the bar of chocolate is practically suitable-for-framing! that chocolate bar survived the trip very well. obviously because its denser. i try my best to tell friends that instead of eating 3 bars of regular milk choco (that has no cocoa in it–i won’t name names) to instead get a bar of higher cocoa like 60-75%. and that should kill the craving instantly–even with 3 bites. A reason to add the Twin Cities to your U.S. itinerary next time….? I love Rogue! I was encouraged to try it a couple of summers ago at Chocolopolis in Seattle (a wonderful place for chocolate geeks) and fell hard. So glad you’re highlighting Colin’s work here – I hope he stays in business for a long time! I ordered a few bars of their (his, really) chocolate in the mail soon after reading that article, and they were indeed excellent (and arrived in perfect condition). I’ve been a fan of his work ever since! Thanks for promoting small business chocolate operators! Even if their fate of some of these smaller companies is to get bought out by larger corporations (e.g. Scharffen-Burger, Dagoba, and Joseph Schmidt were all acquired by Hershey in 2005-06), its still nice to be able to be able to discover these folks when they are still on their way up. Wow, your timing is amazing. A few years ago I landed a great prize from a small scale estate chocolate producer. It just so happened that the box arrived on Valentine’s Day. Since that time I always try and seek out a new producer each year to try on Valentine’s Day. I had completely forgotten for this year until I saw your post. I just placed an order. I bet these guys are going to be busy today! They are already out of the Piura. There is an amazing local chocolate company in my town, Taza Chocolate. I recently took a tour of their factory and the bean to bar process was a lot more complex than I’d imagined! Kind of makes me sad to see the “Rogue” name attached to something from Minnesota. As a commenter noted above, Rogue Ales from Newport, Oregon, are some of the best in the world. Likewise, Rogue Creamery’s bleu cheese was the #1 cheese in the world last year. Oregon’s Rogue Valley and River is one of the most gorgeous and agriculturally productive places in the world, and its wines, produce and dairy are unmatched. This chocolate bar looks and sounds amazing. Like Andrew above, I too immediately related “Rogue” to the Rogue River Valley in Oregon – a spectacular place. I wondered how I had missed its chocolate until I saw your mention of Minnesota. That’s okay! Us Pacific Northwesterners are willing to share the name as long as the quality is excellent and it sounds like it is. A most timely post, as I adore chocolate and am heading for Peru soon. In the last few years they have began exporting some very fine beans I understand. I don’t know any Peruvian chocolate makers so I guess I will have to do lots and lots and lots of research when there. Glad you highlighted this company. I’m so willing to spend our hard earned money on seriously quality food since it brings us both health and pleasure…and I love to support innovative producers at the same time. Look forward to trying this! Thank you for writing about this chocolate. I have family in the Minneapolis/St. Paul area and I’ll definitely be looking into finding some of this! And, I think a visit by you to the Minneapolis/St. Paul area is a fabulous idea! If that ever happens I hope I get a heads up so that I can participate! My sister lives just outside of Springfield, MO and sent me two bars and a package of cocoa powder from Askinosie for Christmas. It is the best gift ever and I’m rationing my supply. Would never have known about that or Rogue if it hadn’t been for you! Thanks; glad to read their source is South America and not Ivory Coast. I’m afraid we’re in for higher chocolate prices due to the major political problems there, nonetheless. That country accounts for one third of the world’s supply – start hoarding now! Very informative post, and it’s great reading all the comments too. Thanks for putting in the hard work and doing all the tasting for us, David. Hard job, isn’t it? Ha! I first read the title too fast and thought it was about a “Drogue Chocolatier”. Would be a great name for a chocolaterie! I’m fortunate enough to live in Minneapolis (yes, I said ‘fortunate,’ in January, in Minneapolis!) and was first introduced to Rogue chocolates at a local fancy foods event, where I visited a bit with the young chocolatier and found the chocolate divine. It’s wonderful that this superb product is being enjoyed by a widening audience. Hi, David. My hometown of Nashville, TN, has a talented “bean-to-bar” chocolate maker named Scott Witherow. His company is called Olive & Sinclair. I’m one of his retailers, and I would be happy to send you a few bars. The chocolate is delicious and the packaging has won numerous awards. Best, though, are the videos on his website. PS: I just finished your “Sweet Life in Paris” book and really enjoyed it. Mmmmmm, I love delicate fruity dark chocolate. Thank you for the fine introduction to this chocolate! Soma chocolate in toronto has the best bean to bar chocolate imaginable.It’s in the historical distillery district. Their spicy hot chocolate shots are famous and deservably so. Thank you for this post! I regularly post chocolate reviews myself and thoroughly enjoy hearing about new artisan chocolate makers the world over, even if most are out of my (Canberran) reach. This looks and sounds wonderful! This is a link to Colin Gasko’s appearance on Martha Stewart’s Show in 2008. A fascinating look into small chocolate production. David Mason of Black Mountain Chocolate also does bean-to-bar. He is one of the few in the country, and boy is it amazing! If you get to NC, you should really get some of his product. The Martha Stewart link is for the whole show. The Rogue Chocolate segment can be viewed by scrolling through the options on the right hand side (past the shrunken apple heads and jack-o-lanterns!). This is probably a question that the answer is akin to finding a needle in a haystack, but by any chance have you ever visited a chocolatier in Chateauneuf-du-Pape located on either D17 or Chemin de Bédarrides à Châteauneuf-du-Pape? I found it about 10 years ago and have lost the name and always wish I could send friends there. If you know it, will you please provide its name. As for American chocolate, have you tried Mast Bros.? interesting chocolatier in the Rogue Valley that makes a truffle with Rogue Creamery blue cheese. also pears from the area, incredible!many interesting products- web sire Lillie Belle Chocolates. worth checking out . thank you for always amusing me with your writing and insights. check out these guys website, award winning stuff! Like Beth, I’m sitting in Mineapolis, Minnesota, with a fresh locally made bar of Rogue chocolate. They are widely available in finer Wine and Cheese shops around here. Lucky us! missjane:That’s a really interesting video; I like the fact that he can make “up to 100 bars a day.” Talk about a micro-enterprise! I remember when ScharffenBerger was starting and their hardest task as well was finding machines that would only do small-batch chocolate, and like Colin, they had to hack a lot of machines..although Colin is a lot more inventive..hilarious that he uses a machine that cleans dentures to jostle the chocolate bars to get out the air bubbles. lori: I don’t know that chocolatier. Could it be Joêl Durand in St-Remy? I’ve been to Mast Brothers on my last trip to New York City, which included a side route to Brooklyn. Jamie: I love the idea of “spicy shots” of hot chocolate, especially in the cold Canadian winter! Amber from Awake at the Whisk brought me some chocolate from Ginger Elizabeth http://gingerelizabeth.com/ have you heard of her? She lives in Sacramento so next time you’re visiting Elise grab some of Ginger’s chocolate. She’s 29 years old (just saying because I think it’s impressive as hell), she is considered one of the best in the world, and her name is Ginger. Rogue is awesome! I too first learned about it when I was working at Gourmet.com. We had samples, and I immediately feel in love but couldn’t find it in stores. Thankfully, The Meadow came to NY and I’m pretty sure they have it! I am so lucky to have a local chocolatière right here in Durham… Dolly Mama. I can conveniently get a fix whenever I need it. Her Sea Turtles are to die for… I try really hard not to eat the whole box at one time. It’s a struggle. 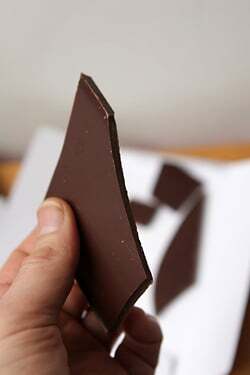 Ranking chocolate wastes bandwidth that could be better spent tasting chocolate. That bar of well-made Rogue chocolate would be the perfect centerpiece on a deserving cake. Thank you for sharing this. MissJane, thank you for the link to the Martha Stewart video of “Colin’s Chocolate Factory”! Everything I had here was amazing and they tend to incorporate local ingredients. Now I will have to order chocolate which will go directly to ,my hips! Especially since the shop in in my old stomping grounds where I grew up! Oh well…what is life without chocolate after all? !!! Love that you indulged in cheese last year and realized chocolate needed some time and attention. I am a big fan of Rogue Chocolatier. Colin is a Rogue’s rogue! Easy to say since I am the face of Rogue Ales’ Chocolate Stout, which is infused in a cheddar cheese made by Rogue Creamery (as noted, both are from Oregon and independent businesses). Curious what beverages you pair with chocolate. Beer Anyone? Thank you for showcasing the amazing Rogue Chocolatier! Most of me is thrilled that Colin is getting international attention, but a tiny piece of me wants to keep him our little local secret! It’s good chocolate for sure. He is America’s best Chocolatier. However, this bar has nothing on his Sambirano. Trust me on that. I saw your post yesterday morning and went directly to their site and ordered 3 bars! The only sad part of this story is that they had already sold out of the Piura bar. 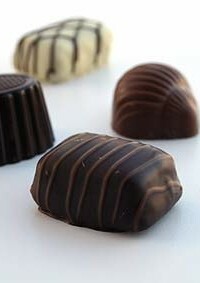 On the upside, I get to try out three new chocolates when they arrive in the mail tomorrow! I especially liked Colin’s Sambirano; reminded me much of Patric’s. btw, did you read the article on BBQ in the Economist’s Xmas edition? Very interesting. This is a great chocolate bar! Great Company! You must make a point to try the exceptionally delicious Olive & Sinclair “Southern artisan chocolate” bars made in Nashville, TN. They claim to be the original bean-to-bar maker of the South. They do variations on % cacao content, but also have unique flavors such as sea salt, salt & pepper, coffee bean, & cinnamon chili. I am never without an O&S bar to nibble on. That is some good looking chocolate. Sure beats the hell out of the stuff we have here. Hi, David – Thanks for posting this! 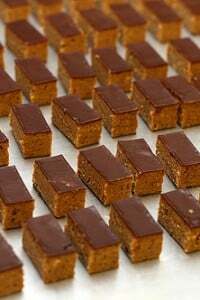 I live in the Twin Cities and am a former chocolatier and didn’t know these guys where around. I am glad to know they are and am excited to try their chocolate and support a local business. I love your blog and your books! Thanks for all the great stories and recipes! Rogue chocolate and Kouign Amann – two things you can find at the Minneapolis bakery where I work! If you do get a chance to visit Minneapolis and try more of Colin Gasko’s chocolate, I do hope you stop in at Rustica for a treat and a hello. Our artisan breads, desserts, and pastries are divine and our coffee is from a local small-batch coffee roaster, Bull Run. Good stuff and, I think, right up your alley. As an aside, your blog helped jumpstart my career as a baker when I decided to leave tax accounting about a year ago. Thanks so much for what you do!